Here's an age-old trick that you can do anytime, anywhere. In an instant, you seemingly pull your thumb apart and then put it back together again. If you're an uncle or grandpa, you almost have to learn this trick to tease the kids. And if you want to truly torment a professional magician, show this trick and ask him if he knows how you did it. The magician seemingly separates and pulls the tip of her thumb away from its base. The magician holds the thumb between the thumb and first finger of the other hand. The magician rests the thumb against the side of the hand. The magician pulls the tip of the thumb away from its base. After that, the magician brings the thumb back together. The thumb is restored. You switch one part of your thumb with the thumb from the opposite hand. 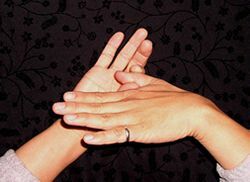 The picture shows the final positions of the thumbs on each hand. You have to practice placing your thumbs into this position. Also note the position of the first finger on the right hand. When you’re ready to perform the trick, you should be able to quickly position your hands in this manner. Note that these hand positions are used when you want to "separate" your left thumb. If you want to separate your right thumb, you must reverse the positions. Grab your left thumb at the main joint between your right thumb and first finger. The next set of pictures ​are from your point of view. Quickly bring your thumbs together. The first finger is positioned to cover the gap between the two thumbs. This transition is the key to successfully performing the trick. This will take practice. Slide your thumb along the side of your hand, maintaining the position of the right first finger. To your audience, the thumb will appear to separate and slide away. To finish the trick, simply reverse the process.